Here’s a pattern I found on Ravelry.com with which I’ve been quite taken. It’s so simple – only 4 rows – you can catch onto the method of it and memorize it quickly, yet it’s so clever: horizontal stripes on one side and vertical stripes – plus Swiss dots – on the other! Every knitter needs a few reversible patterns in his or her head for scarves and blankets and such. I think we all ought to add this to our standard repertoire, right along with other old stand-bys like garter stitch, moss stitch, 3x3 checks, and ribbing. In fact this is ribbing, with the all-important difference that every 4th stitch is slipped (purl-wise). Yarn: For a scarf you need about 200 yards of two different yarns. For anything else, buy very generous amounts of yarn, as this fabric will be dense. It does not stretch the way ordinary ribbing does. This pattern works well with A: one smooth (worsted weight) and B: one fluffy or more textured yarn. You can use white and some bright color or two contrasting pastels, but the pattern doesn’t look as pretty with two bright colors competing with each other. I’m regretting my choice of bright red with bright blue. Needles: Size 9 or 10 circular for a scarf in worsted weight; or, for a rather thick blanket, size 7 for worsted weight or one size smaller than called for by whatever weight of yarn you use. Cast on 31 stitches with color B (for scarf) or any multiple of 4 plus 3. With A – P1, Slip 1 w/yarn in back, P1, *K1, P1, Slip 1 w/yarn in back, P1, repeat from * to end, SLIDE STITCHES TO OTHER END OF NEEDLE, do not turn. With B – K1, P1, K1, *Slip 1 w/yarn in front, K1, P1, K1, repeat from* to end, SLIDE STITCHES TO OTHER END OF NEEDLE, do not turn. Continue until desired length and then bind off with B. TIP: Whenever you have both yarns at the same end of a row, you will need to be consistent in how you handle them. I like to twist them, bringing the yarn “in waiting” under the working yarn from back to front, then over the working yarn. I then hold the yarn in waiting wrapped firmly around the fingers of my left hand while working the first few stitches with the other yarn. Another TIP: The right and left edges differ slightly from one another, but the difference only applies to one side of the last stitch. You may not care, especially if you plan to add a border. 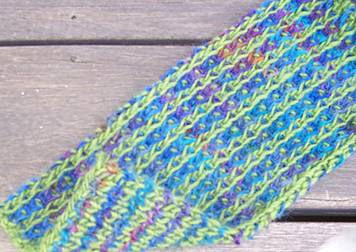 Variegated yarn (“self-striping” in the UK), as in the photo, will also mask the difference. Using selvedge stitches will not. Yet Another TIP: Once you catch on to this pattern (test swatch!! ), you’ll easily understand how to vary it so you don’t need double-pointed needles. That's ... kind of cool. I've never really gotten the hang of knitting, but I'm an admirer of the craft. Very useful pattern. I'm thinking it would make a nice man's scarf if one choose neutral colors.